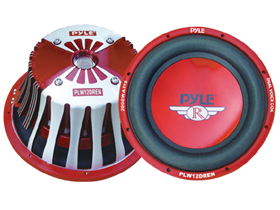 Home > Pyle > Car Subs > 12"
from Pyle provides unmatched and solid sound output! With a wide array of features, these 12-Inch Subwoofers are especially designed from top to bottom up to provide quality sound in a sturdy form quality. Pyle Subwoofers are built to last combined with the looks that reflect power and sophistication! Check these Subwoofers here at HalfPriceCarAudio.com at a very reasonable price!